We proved long ago that innovation in the knife world isn’t dead, thanks to genius knifemakers like the Hawks. 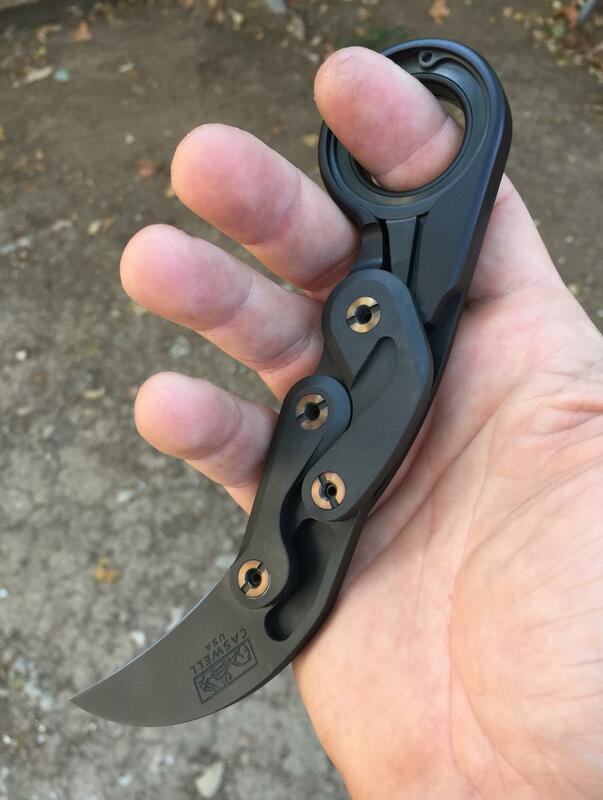 But, for those who need even more evidence that knife creativity is alive and thriving, there’s the Joe Caswell “Morphing Karambit” Version 2 (MKV2). The MKV2 by Caswell Knives boasts a design like few others. It uses a manual morphing action to activate the blade quickly and smoothly. Watch the introduction to the knife. Caswell posted the knife on crowdfunding platform Kickstarter about a week ago with a modest goal of $23,000. As of publication, the project has raised more than $200,000 from nearly 400 backers, making it the top trending project at Kickstarter. It was likely the first time a knife project ever claimed that spot. It still has nearly two weeks to go. Here’s a little more about the knife. The 2.5-inch blade is made with CPM 3V ion bond with a tungsten DLC finish. The handle is 7075 T6 Aluminum. It weighs about 6 ounces and has an overall length of 7.125 inches. According to Caswell, the unique opening mechanism of the knife keeps the blade away from the fingers and has a relatively simple design construction. It would definitely earn a spot on our list of knives with unique opening mechanisms. Because it is a manual-opening knife and it has a 2.5-inch blade, it can be carried most places legally. The price is a direct reflection of the cost to produce. Margins are very tight to bring this build at this price point. This is a high-quality assembly made from premium materials, 100% precision machined, with best-available finishes and hand-fitted in the United States by a proven, world-class builder. This kind of high-quality short production defines a market segment that is well understood by knife enthusiasts and duty professionals. There are many brands dedicated exclusively to producing “working knives” in this price range and beyond. This product level exists for those that demand premium quality and the value it brings. Caswell has been showing off an earlier version of the knife to the public for a few years now and has won several awards for the design, including two awards at the USN Gathering. For those who simply can’t afford the knife on Kickstarter but want to get in on the action, there is some hope. Caswell already revealed that a “major knife brand” has adopted the design and will be releasing a lower-cost imported version by 2019. Overall, this is a very cool creation, and I hope things go swimmingly with the production process. Is Amazon Restricting the Sale of Legal Knives to Some States? While I admire the creator’s ingenuity, the explanation is a poor excuse for the price. Naturally, as a limited production item and being a new company just getting started, costs can be high. The materials although impressive are really not necessary for most of us. People scoffed at Gerber for using 440 steel, yet they have been very successful with their LMF2 which later brought about the Prodigy and the Strongarm. All of these knives are very durable. I’m not into high dollar knives and I don’t feel bad about it when there are a slew of very good, well made, reasonably price blades made of good materials and good steel. Even a $400 blade can break or rust. And those who make blades know that the material isn’t as important as the heat treatment. The “super steels” are nice, but they costs more to work with and that extra costs ends up added to the price. The knife won’t be reduced to junk or by any means be inferior as long as the quality of manufacture is high and the finished product is smooth and reliable functioning. I do think once this karambit (Not pronounced karombit- sounds like Bart Simpson saying Caramba!) design becomes licensed or public domain so to speak, then it will be available to more people and it will be yet another choice for knife users to enjoy. I doubt that at $400 or more that the sales will be as high. That’s a lot of money for EMT’s, fireman and police officers or anyone in the military. And for many civilians it’s a hard sell, no matter how much they might want one. Nice opening system. It’s the first time i’ve seen it. Can’t wait to see it on the market. Hello! I’m a big fan of yours in China. I want to know when the MKV2 will be on sale. What’s the sale price? I really, really like this knife! I’m not into high dollar knives and I don’t feel bad about it when there are a slew of very good, well made, reasonably price blades made of good materials and good steel. I really don’t mind either. If something’s too much, don’t buy it. Let the market decide.